Photo: Andria Patino/Corbis? Corbis. All Rights Reserved. 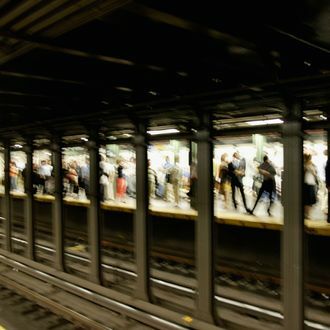 For most New Yorkers, a recent string of brutal subway deaths, covered exhaustively by the tabloids, has made us extra jumpy on the platforms, reminding us to stand far away from the tracks and keep to ourselves. Not Army veteran and Harlem cab driver Isidore Branham: When he saw a drunk man passed out on the tracks, it triggered his dormant hero tendencies. “My instincts just came alive,” he told the New York Post. “All the training kicked in. I thought, ‘I’m here. I can’t let this man die.” Some people have it, some people do not — the least the rest of us can do is take pictures. “He was inside the railbed between the ties. I picked him up from his arms and dragged him across the rails,” he said. “Once I got to the platform, I picked him up from the waist. I wanted to do a fireman’s carry but there was no time. The train was coming. “I felt this man shouldn’t die this day, not while I knew I was capable. I was the man for the job. I used to work in transit. I’ve been on the tracks. I know how dangerous they are. Not that we doubt his story, but the only thing that would really cement Branham’s hero status in this day and age is a cell-phone video. Weak and helpless bystanders, do not be ashamed — we know you’re out there.